We just had a M = 4.3 earthquake along the Mendocino fault zone. Here is the USGS website for this earthquake. 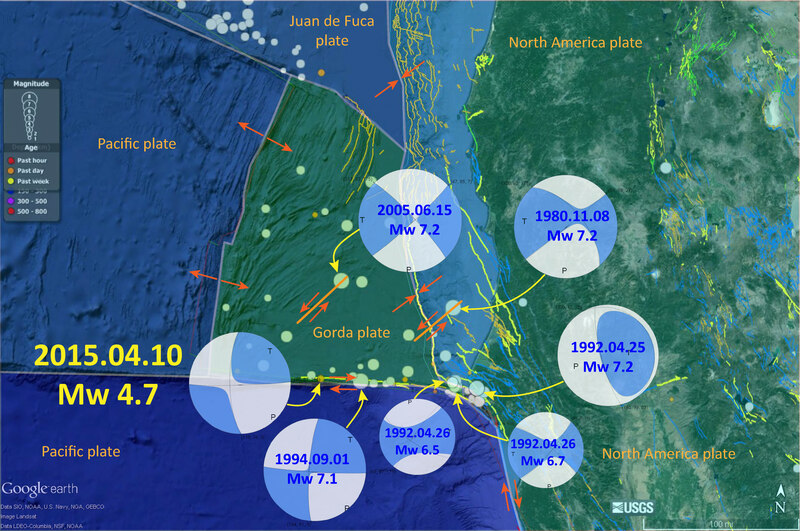 There were some earthquakes of similar magnitude along the MF recently in January 2014 and April, 2015. 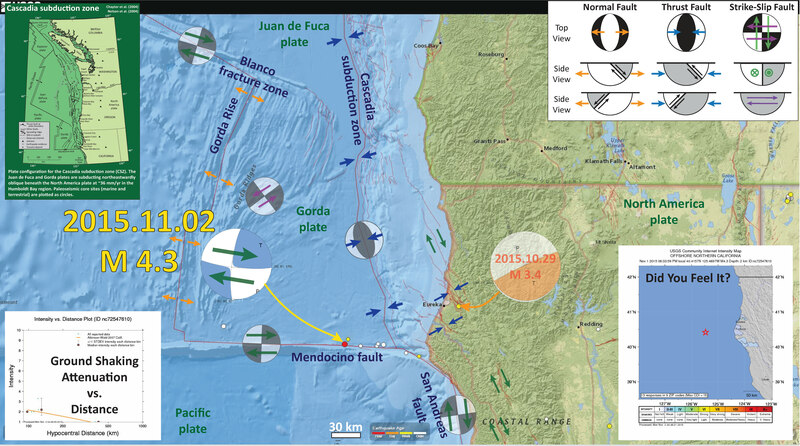 This earthquake appears to have occurred along the Mendocino fault, a right-lateral (dextral) transform plate boundary. 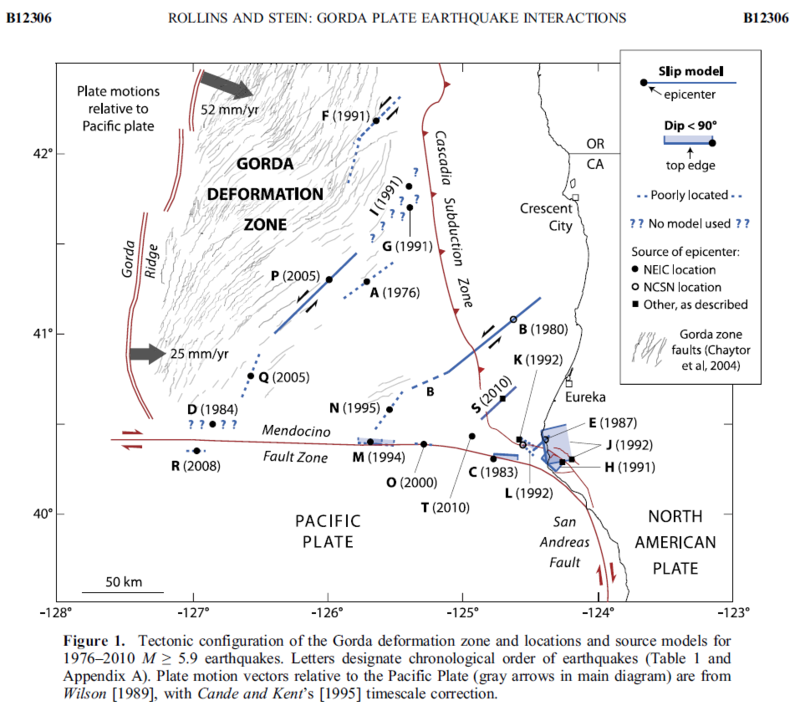 This plate boundary connects the Gorda ridge and Juan de Fuca rise spreading centers with their counterparts in the Gulf of California, with the San Andreas strike-slip fault system. Transform plate boundaries are defined that they are strike-slip and that they connect spreading ridges. 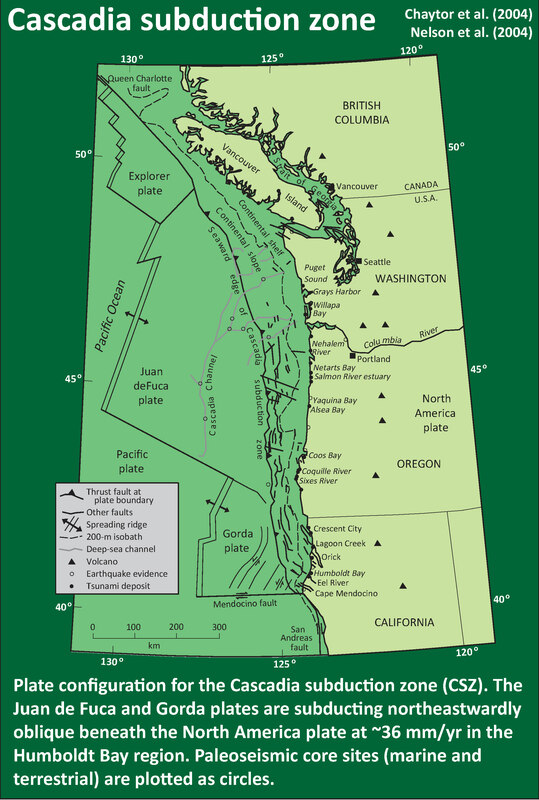 In this sense of the definition, the Mendocino fault and the San Andreas fault are part of the same system. Here is a map that shows the epicenter as a red circle. I also plot the moment tensor for this earthquake, along with the epicenter and focal mechanism from a recent earthquake in the Gorda plate on 2015.10.29. I interpret this M = 4.5 earthquake to be a right-lateral strike-slip earthquake. In the above map is a plot showing how the ground motions attenuate (lessen) with distance from the earthquake, in the lower left corner. The orange line is an estimate of the intensity of ground motions based on a numerical model. This numerical model is based on a regression of hundreds of earthquakes (distance vs. magnitude/intensity). These regressions form the basis for Ground Motion Prediction Equations (GMPEs). The blue dots are the actual observations made by real people. These model based estimates of ground shaking intensity are used, especially for larger earthquakes, to determine what damage might be expected. The results of the DYFI survey are plotted in the inset map in the lower right corner of the above map. This page has some maps that show earthquake summaries for various sources. This figure shows what a transform plate boundary fault is. Looking down from outer space, the crust on either side of the fault moves side-by-side. When one is standing on the ground, on one side of the fault, looking across the fault as it moves… If the crust on the other side of the fault moves to the right, the fault is a “right lateral” strike slip fault. The Mendocino and San Andreas faults are right-lateral (dextral) strike-slip faults. Here is an IRIS animation showing a transform plate boundary fault as it relates to spreading ridges. 2 Responses to Mendocino fault earthquake!